Students from the Gunn Scholar Program will share their original place-based and primary-source research during the second annual Rooted Research Conference on Sunday, April 28, from 9 a.m. to 4 p.m. in the Tisch Family Library on campus. Gunn Scholars are selected to participate in this unique, yearlong program, which affords them access to The Paula and George Krimsky ’60 Archives at The Gunnery, and opportunities to conduct research in locations such as the Baseball Hall of Fame in Cooperstown, the National Archives in Washington DC, or the Beinecke Library at Yale. 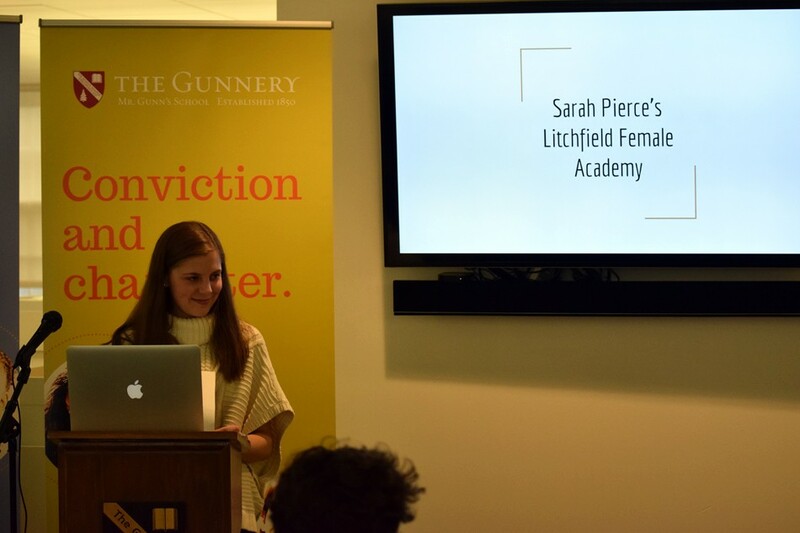 The 2018-2019 Gunn Scholars will present their research on the following topics: the development of student publications at The Gunnery, and the vital role of the school newspaper; the Vietnam War and its influence on The Gunnery and individual veterans; the role of women throughout The Gunnery’s history, from Mr. Gunn’s wife, Abigail, to the young women who were enrolled in Mr. Gunn’s school in the 19th century; and the architecture of The Gunnery campus as viewed from dual perspectives: as historical landmarks and the philosophical approach of those who designed the structures. The community is invited to attend. Admission is free. Registration is required. Please email gunnscholar@gunnery.org.